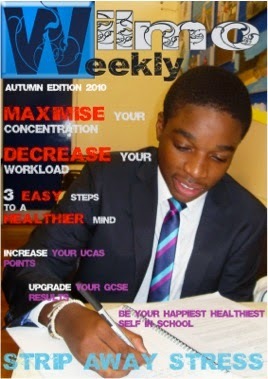 This is the magazine for the Wilmo School. This cover looks very cheap and just thrown together in my opinion, but the way they have coloured the font is very smart. The subheadings and titles they have included on the cover are relatable for students, like “Maximise your concentration”, “Decrease your workload” and “3 easy steps to a healthier mind”, these are all problems that students have and this magazine would relate to their issues. Also they have coloured the headings with the command words in red because they want it to stand out. Like “MAXIMISE your concentration” is in capital, bright, bold, red letters because they want you to see it first and because it is urgent, and red represents importance and urgency. But the masthead seems very cheap to me and isn’t very clear, the black squiggles inside the font make it harder to read and there is just a general clash of colours throughout the whole cover.